Norbert Burgmüller was born into a family of musicians in Düsseldorf in 1810. He was a pupil of the composer and violinist Louis Spohr in Kassel, where he worked as a piano teacher, pianist and composer. He was to marry an opera singer of the Court Theatre, Sophia Roland (1804-1830). But Sophia broke the engagement in 1830 in Paris and died soon afterwards in Aachen. Allegedly this resulted in an epileptic attack and he certainly started drinking excessively. He returned to Düsseldorf and lived with his mother until his death. In 1833 he travelled to London to work as a choir repetitor, but this turned into a failure and he returned seriously ill. Back in Düsseldorf he was supported by Felix Mendelssohn-Bartholdy, who lived there at the time. A second engagement, with the governess Josephine Collin, failed as well. After Mendelssohn left Düsseldorf in 1835 he found himself artistically isolated. Now he befriended the poet Christian Dietrich Grabbe (1801-1836), who drank as much as he did himself. He wanted to leave for Paris, but before he could do so he drowned when - invited by a friend - he took a bath in Aachen that was meant to be healing. 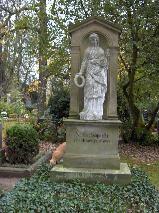 The grave of Norbert Burgmüller at the Nordfriedhof in Düsseldorf.